As anyone who has read my previous articles knows, I take a great interest in the world of books and this includes book groups of all shapes and sizes. I thought that it would be interesting to scout around and see what other sorts of book clubs are out there. I’ve already taken a look at the One City One Book type of group, so while I was googling for information on the ‘Lost Booker’ prize titles (inspiration for my own book group) I discovered a Lost book group. That is to say, a club devoted to reading books that tie into to the plot of Lost. And then I realised that there isn’t just one Lost book group, but indeed several of them, including (perhaps not surprisingly) an ‘official’ ABC one. And that’s just for starters; there are more types of book group than you could shake a stick at. Some are online, some offline and some in between and a whole range of tastes are catered for into the bargain. As I’m based in Dublin I was interested to come across many groups engaged solely with reading the work of James Joyce, particularly Finnegan’s Wake (often a page at a time as far as I can see). At this point I will venture the opinion that if there isn’t yet a book club built around the titles that should have, but didn’t, make the Booker shortlists then there ought to be. I haven’t found one yet, but that doesn’t mean that there isn’t a Booker related book club around somewhere. You could compile a fantastic list of titles and nobody could question your choices, since everyone knows that every critic always has his/her own opinion on what should have made the shortlist in any given year. For example, the Irish Times’ critic Eileen Battersby was not at all impressed (to say the least) that Paul Murray’s Skippy Dies failed to make the cut this year and had a bit of a rant about it all. You’d think that critics would have got the hang of the Booker by now. So in short, there will always be plenty of titles to choose from for this book club and that’s without considering the raw material supplied by the short list titles that didn’t go on to win....phew! It’s also fair to say that the long list for the 1970 ‘Lost Bookers’ one off award would keep any self respecting book group happy for a while. I plan to try that idea out on my own book group this month. I might make a start by proposing that we read the winning ‘Lost Booker’ novel, J.G. Farrell’s The Troubles that I’ve never found time to read. There’s nothing like an award to give you an excuse to read a book that you might not have got around to otherwise. (see http://www.squidoo.com/lost-book-list) there is certainly plenty of material for substantial intellectual discussion. I made a count of around fifty titles on the above site so there’s plenty to keep fans going. But what about the sheer scale involved? One Lost club has around 600 registered members (http://www.goodreads.com/group/show/94.LOST_Book_Club). And that’s just the tip of the iceberg that is media related/on line book clubbing. If you throw in all those readers who read along with Richard and Judy or Oprah (to take two further examples of media led book groups) you have a whole lot of readers all doing their own thing, but doing it with a whole lot more people at the same time. I am curious as to how the scale of these undertakings affects the readers’ enjoyment and engagement with the books. What do they get out of it compared to a more traditional type of club? I’m throwing questions out that could perhaps form the basis of research into the fascinating world of book groups and the people who inhabit it. The Lost clubs alone would merit a significant chapter all to themselves. I’ll make a modest start on the question in this short piece, by asking what makes someone join a book group (of whatever type) in the first place. If I may use my own experience here, it might provide a pointer. A few years ago I moved to Ireland with my partner and young child. I knew nobody and had to try to forge a new social life. At the time I wasn’t working so I lacked the obvious opportunity to make social contacts and my only option seemed to be joining toddler groups. When a book lover at one toddler group invited me to join her book club, I leapt at the chance to do something that involved both books and potential new (adult!) friends. Having said that, I had never previously felt the need to join one due to the circumstance of working in a bookshop and having access to more books than I could ever hope to read. I also had an established social circle so didn’t have an overwhelming need for new company. So I could quite easily have spent the rest of my life in complete ignorance of the book group phenomenon. My only insight into the mechanics of book groups was from customers choosing and ordering books for various local groups. Not everyone is perhaps in the situation of being lonely in a new environment, but many people probably join a group in hopes of meeting like-minded people and improving their social life. There is a difference however in joining the kind of group where there is a ‘meet-up’ element from joining one that is solely media facilitated. In the case of the latter type of club there is still just you and a computer or television screen, which doesn’t seem very convivial to say the least. So what is the attraction? Or maybe I’m looking at it from the point of view of someone who likes to meet book lovers over a cappuccino instead. Many libraries organise book groups, as do book shops. These may be themed groups, such as poetry, crime or classics. Meeting to discuss books surrounded by books seems ideal to me, but I‘m also happy to go along to the pub; it’s the meeting people bit that matters most though. I just can’t see myself joining a virtual book group. Though of course there are snags to having a face-to-face club. Discussions can get rather heated at times if there is a clash of opinion. Either that or you go completely off the point and talk about everything and anything but the book in question. I’m afraid that our book club is rather guilty of that particular crime. But I’ll admit to being intrigued by the idea of a media related book group that has nothing to do with Oprah, Richard and Judy or squishy sofas and daytime television. I have never yet come across a television drama series that spawned a book group; I am however open to correction on this point. But is Lost a book group as many people would know it? The starting point is certainly having a great interest in the programme; I doubt if anyone one would join without that factor. This then would give members something in common right from the beginning. Presumably there would be no awkward silences if you were going along to an actual (as opposed to a virtual) meeting. 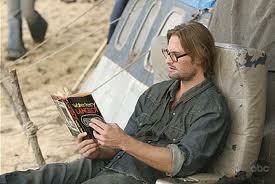 In the case of Lost’s book groups, the very nature of the long running series, with its fiendish plot twists and gripping cliff hangers would be a powerful incentive to join in. You might even stand a chance of understanding the ending of the drama (well perhaps that’s a touch optimistic) through discussions with fellow fans. I might even join one for that reason. On-line/media book groups that are globally ambitious in scope such as the various Lost book groups do however seem to foster a great sense of belonging to something significant and larger than life. There is obviously the chance to connect with more people (and in more far flung places) than you could ever hope to meet over a coffee and sticky bun. Another example of this type is when Yan Martel’s book Life of Pi was the subject of a world wide ‘readalong’ in August 2009. At the start of that month Martel posted the following lines on the book’s website, ‘Art works because it is participatory; the writer throws some words onto the page and then it is the reader who brings them to life. So thank you for bringing Life of Pi to life.’ This ‘bringing to life’ is multiplied hundreds of times over by a global event such the 2009 reading of the book. In the case of the Lost book clubs it is arguable that it isn’t just a novel writer’s art that is being brought to life. The art of the programme’s entire team is involved too, since the books are an integral part of the plot of the drama. Martel is speaking as a novel writer, but his words could equally be stretched to encompass Lost’s script writers who wove various and varied books into the plot of their drama. It all adds another layer to the book group experience. If I were to be cynical (heaven forbid), I might point out that the official Lost book club is also presumably a handy money spinner from ABC’s point of view. There is also the bonus of keeping interest in the series alive now that the final programme has aired, in the interest of series merchandising. As far as I can work out, the Lost book groups came about as an accidental spin off from the long running series. These groups were originally set up by fans of the series who also happened to be readers, wanting to explore the books and their possible involvement in the complex plot of the unfolding drama. This, as I have said adds a whole other dimension to a traditional book discussion forum. Here the plots, characters and settings of the drama are as important and relevant to the group as the book itself. The lengthy Lost book list has been divided into sub-lists. For instance there are books that have been read in the programme by a specific character (e.g. Sawyer) or a list of books whose titles have a connection to the titles of some of the episodes (e.g. Through the Looking Glass and Tale of Two Cities). There is even a book (Bad Twin) which didn’t exist before it was featured in the plot. That twist adds a whole new meaning to the phrase hot off the press. Recently I decided to log on to the BookCrossing site again (www.bookcrossing.com) and take a look to see if anyone had by any lucky chance registered a copy of a children’s book that I’d love get my mitts on.